How to use AirDroid through Linux - All of we know that Android has so many users in the world, and it is one of many successful Linux innovation built from versatile Linux kernel. Users and developer are freedom for creating excellent application. This post will tell about AirDroid, an application which let you control, manage, transfer files such as music, photos, your Android devices via web browser. You can use that features and browse it from any operating system, including Ubuntu Linux. Lets start! 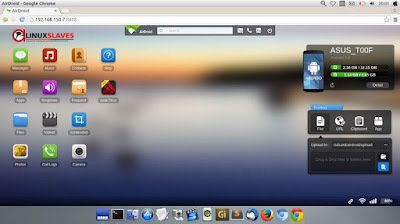 First install AirDroid to your Android device. You can search and install it via Google Play. Once installed, open the app. Ringtones - Search, preview, import, export, delete and customize notifications and alarms. Explore yourself for further experience. If you need a desktop Client like Shareit in order to share the files or folder between your Android phone and Ubuntu desktop, please read our new post Alternative to Shareit For Ubuntu Linux and Derivatives System. So that's all I can write about Easily Access Android Phone From Ubuntu Linux. Hope you've enjoyed reading this tutorial as much I’ve enjoyed writing it. Please comment with feedback to support us. Thanks for visit.